I wrote this a while ago, as part of a project I was working on. It ends abruptly, as I switch to talking about stuff relevant to the project at hand. 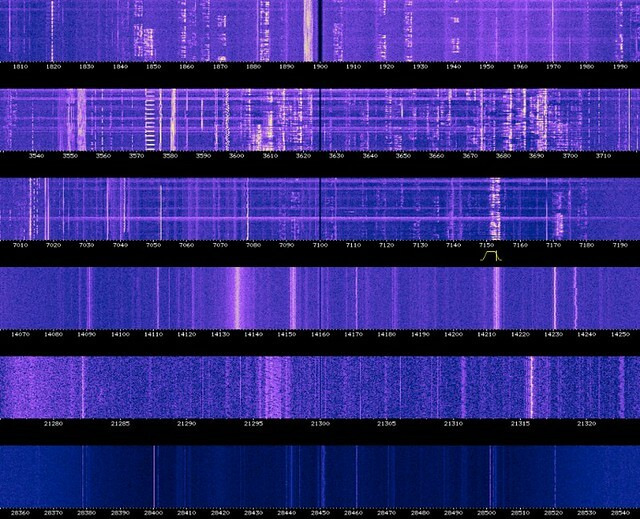 Earlier today I found myself scanning through a High Frequency WebSDR station from the University of Technology Eindhoven (don’t ask), and the screenshot below reminded me of what I meant by the “full spectrum white noise of the network”. The rest of the piece is nonsense, but there’s something in there somewhere, and one day I’ll try and work out what it is. The phrase “cloud computing” almost certainly originates from the symbols drawn by engineers on networking diagrams. When representing the rest of the internet – the amorphous blob of computing just beyond the horizon – scribble a cloud and be done with it. I never drew a cloud: I preferred to the draw the earth/ground symbol. You don’t connect to the cloud, you ground off to the internet. It seems like a better metaphor: computing flows through physical pipes, popping up in data centres and road-side boxes and telegraph poles. The cloud is a lie. And I never understood the “ether” in Ethernet. By taking the radiation and constraining it in a waveguide (cable), we’ve taken it out of the ether. It’s the wireless technologies that should be called Ethernet. I’ve always wondered what would have happened if we’d developed wireless networking first. If it had just happened to look easier at the time. An internet grown out of Ham Radio enthusiasts, rather than military hard lines. If cabled technology happened to be a recent development, designed to tunnel the radiation through a waveguide to get more distance and less interference. How would that have changed the infrastructure and the topology of the network? Would the tragedy of the commons have killed it early, as we battled for the same spectrum space amongst our neighbours? Or would we have reached a steady equilibrium, careful to share this precious resource? What social or political environment would have made that possible? And would the bandwidth limitations of a shared spectrum have encouraged a internet that’s halfway between broadcast and P2P? Something between pirate radio and teletext++. Could the mobile phone be considered to be an integral, structural, deep point in the network, or something that always feels like an edge node, flitting in and out of existence? Could you pull it out of your pocket and watch the data soar through it, as packets spool in and out, trying to find their way?